Ukraine Program/Travel Info | His Kids Too! This page provides a variety of useful information for pre-adoptive parents and travelers to Ukraine. The US Embassy in Kyiv is very helpful with adoption cases and can give you particular information about troublesome regions and steps in the process. Their number in Kyiv is (044) 246-9549, or 246-8559. Visit the embassy Web site at http://ukraine.usembassy.gov/infocentral_eng.html for additional information about Consular services. We strongly encourage people to learn some of the language, not only to be respectful to the people you will meet, but to help with the transition that your child will be working through. The Adoption Center of Washington sells an audio tape and booklet called Child Speak-99 Ways to speak to your child in Russian. It is sold for $35 and sent to you by priority mail. Just send a check made out to Adoption Center of Washington, 100 Daingerfield Road, Alexandria, VA 22314. If you have questions, call 1-800-452-8278. We highly recommend, and have used ourselves, Pimsleaur’s ‘Learn to Speak Russian’ audio tapes (Beginning and Intermediate available), available at your local library. His Kids, Too! discourages monetary gifts, but instead encourages a material gift selected for specific people for a specific need. Additionally, we strongly encourage a gift be purchased and left at the orphanage that all orphans can benefit from, i.e. water heater, cooking pots/pans, blankets, sheets, diapers, shoes, food, vitamins, medicine, clothing, etc. We suggest a gift amount for the orphanage to be in the area of $500.00.When traveling for adoption purposes, you will meet people along the way, that may assist you in the process. It is always nice to give them a little gift as a parting. You can purchase many things in Ukraine, so don’t overload yourself with too many things. It would be wise to talk personally to several parents and/or facilitators who have recently participated in adoptions in Ukraine about the money issue. In terms of gifts, it is customary to give the people that assist you in the adoption process (office workers, etc.) a gift. It is up to each parent (and/or agency or facilitator) to decide what is appropriate in these situations. If you find yourself or your adoptive child in need of professional medical assistance while you are in Ukraine, you may want to consider contacting the American Medical Center in Kyiv: www.amcenters.com – (044) 490-7600. Dr. Anthony Carbone, Chief Medical Director, is the only American Board Certified Medical Specialist in Family Medicine. During the pre adoption period, you completed a document: Letter of Obligation. This letter states that you will inform the Embassy annually of the status of your adopted child/ren. Additionally, it is highly suggested (by the Embassy), if there are changes throughout the year, i.e. you dissolve the adoption, or something such as this, you report this information to the Embassy. Remembering your child retains Ukrainian citizenship until 18yrs. of age, they have the right to know what is happening with their citizen. The Ukrainian legislation requires that adoptive parents provide the Ukrainian Consulates with annual reports on adopted child (children). 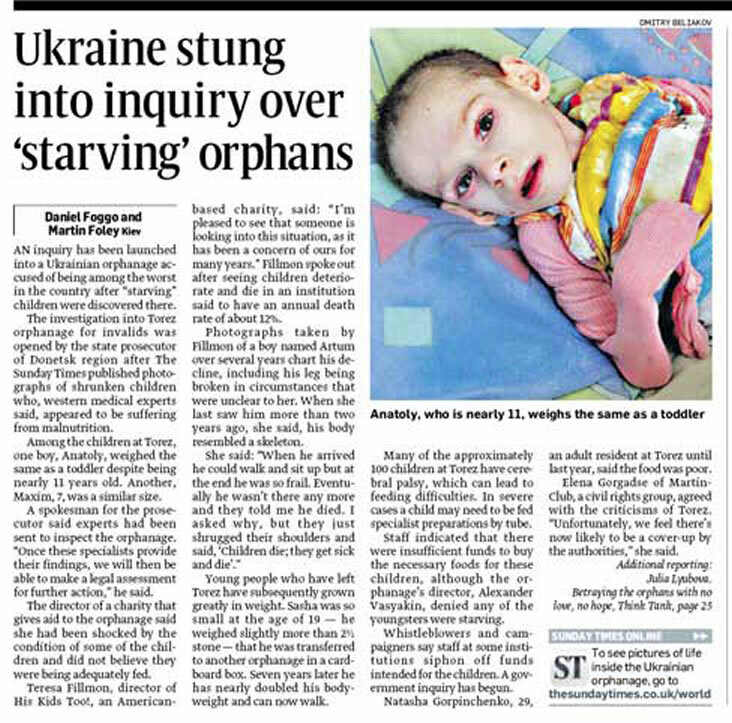 Please be so kind as to send annual reports to the Ukrainian Consulates once a year for the first three years after adoption, and then once every three years until the child reaches the age of 18. The Consular Office of the Embassy of Ukraine will be grateful for your detailed reports about adopted child(ren)’s living conditions and development and pictures of your family.